The R Consortium is exploring the benefits of recommending that R package authors, contributors, and maintainers adopt the Linux Foundation (LF) Core Infrastructure Initiative (CII) “best practices” badge. This badge provides a means for Free/Libre and Open Source Software (FLOSS) projects to highlight to what extent package authors follow best software practices, while enabling individuals and enterprises to assess quickly a package’s strengths and weaknesses across a range of dimensions. 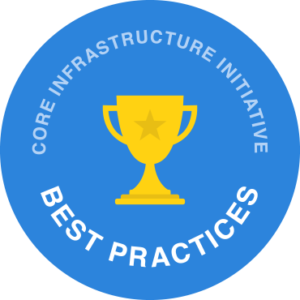 The CII Best Practices Badge Program is a voluntary, self-certification, at no cost. An easy to use web application guides users in the process.